The Door Industry Journal: The Summer 2015 digital issue of the 120 page Door Industry Journal is ready to read Online! The Summer 2015 digital issue of the 120 page Door Industry Journal is ready to read Online! The Summer 2015 digital issue of the Door Industry Journal was recently published online and it's our biggest ever, containing 120 pages. You can read this new issue without subscribing at www.dijonline.co.uk or by clicking the cover image above. And for those of you who have a subscription to our printed version (see offer below), they will be dropping through subscriber’s letterboxes very soon. 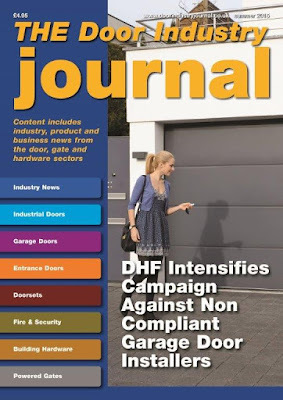 Of particular note in this issue, is our lead story on page 6, which highlights the campaign by the DHF, working closely with trading standards officers, in a bid to reduce the number of unsafe and non compliant domestic garage doors being installed throughout the UK. Following on from the lead story is a report on page 49 about coverage obtained in May on the BBC TV consumer programme Don’t Get Done, Get Dom. In this instance, Nick Perkins from the DHF was invited onto the programme to give expert advice on a householder’s automatic garage door that was not fit for purpose. Another interesting piece worth reading is an in-depth article on page 8 describing the shift in the last decade towards the use of Doorsets and Door kits by the construction industry. If you have ever visited a Building Supplies or DIY outlet in Europe, you will know they’ve been popular over there for years, but here in the UK it has taken a long time for house builders to realise how much installation time and money they could save by using them. Do you know your door closers? Last but not least, if you need to swot up on your door closer knowledge, then you should read the two features on the subject; the first from Assa Abloy UK on selecting the right kind of door closer for a particular application on page 94 followed by another from Samuel Heath on the benefits of concealed door closers on page 101. We trust our latest issue will provide you with an interesting and informative read, so until our next issue in late November, we will leave you to enjoy the sunshine that August promises to provide. We are offering 500 free printed subscriptions on a first come first served basis, to anyone in the door and gate industries who do not already receive a copy. To claim your personal copy please subscribe here.